This new year, Reena Kaushal Dharmshaktu will be looking for a phone. A satellite phone, to be specific. On 31 December, Dharmshaktu expects to be the first Indian woman to ski to the South Pole and she would like to call her husband when she gets there. Dharmshaktu is part of an all-woman team that is skiing 900km from the coast of Antarctica to the South Pole as part of the Kaspersky Commonwealth Antarctic Expedition that started 19 November. Equipped with only a compass and GPS, eight women (from Brunei, Cyprus, Ghana, Jamaica, New Zealand, Singapore and the UK besides India) are lugging sledges laden with food, fuel and equipment over crevasses and through blizzards at temperatures around 30 degrees below zero. Without cooks or guides or any logistical support, they will be on their own during the six-week adventure. Some potential sponsors thought otherwise. “When I asked the Delhi government for financial support for the expedition, they said we only support competitive sports. I approached corporate houses and ministries, but nothing. And everyone said you should go to women ministers, as they will have a soft corner," she said, laughing. However, just days before the expedition, the participant from Singapore discovered a kindred, adventurous soul in the Asian head of the software protection company Kaspersky Lab—and the team’s sponsorship worries ended. This expedition isn’t Dharmshaktu’s first. Daughter of an army officer, she was brought up in Darjeeling. Now in her mid-30s, she attributes her attraction for the hard life to her childhood. “Most mountaineers are from the hills. It is not hard to see why, when all you could see from there were some of the highest peaks in the world," said Dharmshaktu, a professional mountaineer. Her husband is one too. While Dharmshaktu grew up in the eastern Himalayas, waiting for the day she could scale the peaks, Loveraj Singh Dharmshaktu did the same at the other end—the western Himalayas. And they met in the Himalayas, of course. “We met for a very short while in Ladakh in 2000 for the first time. I was returning from an expedition and she was departing on one," said Loveraj, an inspector with the mountaineering team of the Border Security Force. From then on, Loveraj ensured that the time he spent at the Indian Mountaineering Foundation (IMF) in Delhi coincided with the time Dharmshaktu spent there. Married in 2003, the most time they have ever spent together was at the IMF—before they got married. “We have never been on expeditions together; not even one. In India, they are mostly separate. Sometimes, we meet at Manali for a few hours, when he’s leaving on an expedition and I am coming back to Delhi," said Dharmshaktu. Besides her husband, few understand why Dharmshaktu does what she does. “It’s good for me that I found him, someone who supports me. I think if I had a husband who was a regular guy, it would have been difficult to explain why I disappear for one or two months totally, no phone, nothing. But this is probably good for a marriage. Love remains for a long time," Dharmshaktu remarked with a chuckle, nudging her husband. And when both are in Delhi, they are inundated by the questions and concern of family and friends on why their family isn’t bigger. “Being a mountaineer might make you healthy, but not your finances. That is why our family is not bigger," said Loveraj. For now, his eyes are on his ancestral house in the scenic village of Munsiyari in Uttarakhand. “I would like to go back there and maybe, with a loan, build a cottage—something new, not a run-of-the-mill home stay," he added, petting his overweight mongrel Babu. While Dharmshaktu flitted from one room to another to attend phone calls every 10 minutes, Loveraj returned with a scrawny, paralysed crow he had been nursing to health. For both of them, love for the natural world comes second only to their love of altitude. 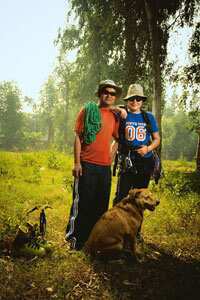 “Every parent should expose their kids to basic trekking. It increases confidence, teaches cleanliness, and, above all, the basic love for nature," said Loveraj. Though the couple is tied in occupation and life, their careers have taken different paths. While Loveraj has scaled Mount Everest thrice and the Kanchenjunga once, Dharmshaktu has climbed the Argan Kangri peak (6,789m) in Ladakh, a peak that hadn’t been scaled before, and soon hopes to be able to add the South Pole experience to her accomplishments. As Dharmshaktu put it: “He has been to the highest point and I have to go to the southernmost point in the world." Loveraj is evidently as proud of Dharmshaktu representing India as she is of his conquests. “No, I am not jealous she is going to the Pole," said Loveraj. “But you should be," she quipped. While Dharmshaktu pitches her tent on polar ice and survives on dehydrated food and melted ice, she will miss some things. “Like you want to go to the bathroom and the bathroom is right here. In a tent, you have to go around looking for a place in sub-zero temperatures. Not fun." Dharmshaktu left for the South Pole on 5 November. Her husband was to head north shortly after. But they hope to meet soon, somewhere.